One of the latest creations to come from Kawabata Makoto’s collective actually comprises three mini-albums, each with the same artwork, but all featuring different music. There’s enough tunage here to fill out one solid album (three tracks, each in the 15-20 minute range), so the fact that it’s come out on three separate discs all seems a bit gimmicky, but the music holds up, being three totally different styled pieces, making these worth seeking out. Plus, the cover art by Bob Vido is amazing, a dazzling 3D image of a flying saucer set against a landscape that seems to extend deep into the background. It’ll blow the minds of you and all your friends. Musically, Volume 1: Ziggy Sitar Dust Raga is and is not what you would expect. There’s no David Bowie influence here, but this is a mesmerizing raga with cosmically dreamy vocal shadings, liquid synths from AMT regular Higashi Hiroshi, Kawabata Makoto on tamboura, and of course, plenty of psychedelic sitar courtesy of Cotton Casino. A hyper-mellow, spaced-in freak out, it’s the AMT at their most acid drenched. Volume 2: Diamond Doggy Peggy is the shortest of the three, but still packs a punch. Cotton Casino’s space whispers give way to one of AMT’s best heavy jams. Tsuyama Atsushi plays monster bass, thundering away in an extremely loose rhythm with drummer Akano. Cotton Casino continues to shriek and wail throughout as deep space synths woosh and cry in the background and Makoto unleashes storms of fury from his guitar. Volume 3: Cosmic Funky Dolly, returns to a more tranquil atmosphere. This is a duet of sorts, an electronic meditation with Casino and Makoto both playing synths, Casino adding her weird space whispers, and Makoto credited with “direct touching a resistor”. This one’s totally minimalist, like the experimental score to some 70’s sci-fi movie, but it draws you in and takes you on its trip quite effectively. Each disc is limited to 1000 copies, and according to the Important Records web site (www.importantrecords.com), it’s already out of print. But you should be able to find copies of them out there still (I did), whether it be on Ebay or from your favorite mail-order service). 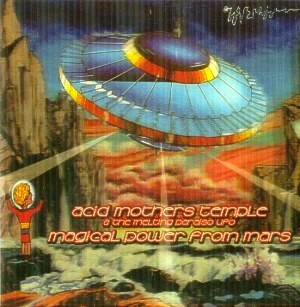 Visit the Acid Mothers Temple at their web site: http://www.acidmothers.com.